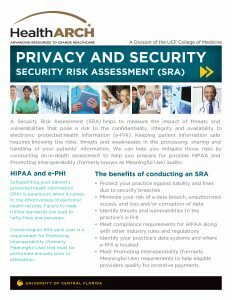 A Security Risk Assessment (SRA) helps to measure the impact of threats and vulnerabilities that pose a risk to the confidentiality, integrity and availability to electronic protected health information (e-PHI). Keeping patient information safe requires knowing the risks, threats and weaknesses in the processing, sharing and handling of your patients’ information. We can help you mitigate those risks by conducting an in-depth assessment to help you prepare for possible HIPAA and Promoting Interoperability (formerly known as Meaningful Use) audits. What are the benefits of conducting an SRA? Safeguarding a patient’s protected health information is paramount when it comes to the effectiveness of electronic health records. 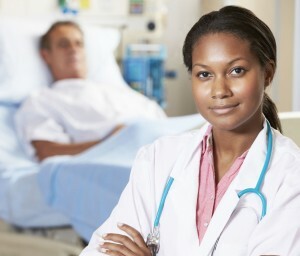 Failure to meet HIPAA standards can lead to hefty fines and penalties. Conducting an SRA is a requirement for Promoting Interoperability (formerly Meaningful Use) that must be performed annually prior to attestation.